Whether riding horseback through the “Trail Riding Capital of the Southeast” or exploring the natural treasures of the portal to Big South Fork Country — home to sandstone bluffs, natural bridges, refreshing waterfalls and two of the largest natural arches in the Eastern U.S. — the people of Jamestown are used to blazing trails. As the home of great American revolutionaries and intriguing rogues, not to mention World War I hero Sgt. Alvin C. York, Jamestown offers a fascinating and multidimensional view of our nation’s history. And with features like the landmark York Gristmill, perched along the Wolf River; world-famous 127-Sale, the world’s longest yard sale; and Highland Manor, Tennessee’s oldest winery, Jamestown visitors and locals can enjoy a great range of cultural and consumer attractions. Even with its own municipal airport and location on U.S. Highway 127, Jamestown manages to remain seemingly tucked away in the quiet, peaceful country of the Upper Cumberland — ready for you to discover. Blaze your trail. County property taxes can be paid by mail or in person at the Fentress County Trustee's Office, which is located inside of the Fentress County Courthouse. Payments are accepted Monday through Friday from 8 a.m - 4 p.m., excluding all state and federal holidays. City property taxes can be paid by mail or in person at the Jamestown City Hall. Payments are accepted Monday through Friday from 8 a.m. - 4 p.m., excluding all state and federal holidays. The Water System Improvements project consists of a number of enhancements to the Jamestown Water System. 1) Raw Water Intake Improvements – to consist of removal of sediment and debris from the City Lake (which provides source water to the City water treatment plant) to improve influent water quality to the plant and to replace components of the raw water intake to provide for greater flexibility for the city to withdraw water from the Lake. 2) Hospital Water Storage Tank Rehabilitation – to consist of blasting and painting of the interior and exterior of the City’s 225,000 gallon elevated water storage tank near the Jamestown Regional Medical Center, and 3) Water Treatment Plant Improvements – to consist of the replacement of electrical systems, controls and computer systems within the City’s water treatment plant to increase plant efficiency while providing for greater operational flexibility thus ensuring compliance with state and federal water quality standards. This portion of the project will also consist of the installation of a new backwash sedimentation basin which serves to treat waste discharges from the water treatment facility. The project is currently in design phase and is anticipated to be released for construction in the spring of 2015. The project is slated to be completed during 2016. The Jamestown Community Center, which serves as an emergency shelter for the City of Jamestown and Fentress County is currently provided with a temporary standby/emergency diesel generator by the Tennessee Emergency Management Agency (TEMA). The generator is necessary to ensure that the Community Center can stand as an emergency shelter during times of extended power outages. A new permanent generator is necessary at the facility to ensure long-term viability of the emergency power source to this critical facility. The proposed project consists of the installation of a new 250 kW natural gas fired generator along with associated electrical system improvements within the Community Center. The design phase is currently completed for the project and is currently in the permitting phase with the State of Tennessee. It is anticipated that construction will commence in late summer of 2014 with completion slated for early 2015. 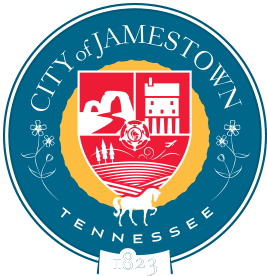 A big congratulations goes out to the City of Jamestown for being named a Tennessee Downtown community! This is a very prestigious honor: Only six communities are awarded this grant every two years. This grant provides education on managing effective downtown revitalization programs.The efforts to become a Tennessee Downtown began with a Restore Jamestown steering committee with the City of Jamestown serving as the sponsoring organization. The steering committee works together toward creating better downtowns for their communities to enhance quality of life, increase hometown pride, stimulate the local economy, create distinctive experiences, and reconnect with their unique heritage and sense of place. The City of Jamestown has been very fortunate to receive Community Development Block Grant (CDBG) funds to rehabilitate its sewer system. Community Development Block Grant funds is a competitive grant process in which funds flow through the State of Tennessee from U.S. Department of Housing and Urban Development (HUD). Community Development Block Grants benefit low to moderate income communities. The CDBG funds are used to promote economic and community development as well as infrastructure in small cities across Tennessee. The SR 62 gas line relocation project consists of the installation of a new 4” high pressure gas line near State Route 62 in Clarkrange. This project is required in order to relocate the City’s existing gas line to accommodate for highway improvements proposed by the Tennessee Department of Transportation. The project is currently in design phase in alignment with the state design contract. Design is anticipated to be completed in July 2015 with an unknown construction release date. The Woodlawn Road Pump Station Improvements project consists of the replacement of the City’s existing Woodlawn Road Sewer Pump Station with a larger more efficient pumping station to accommodate for an increase in sewer flows within the Crooked Creek Drainage Basin. The project will consist of new pumping facilities, system controls, and required sewer line modifications to ensure compliance with state and federal requirements. The project is also expected to provide for a much more efficient operation that will reduce overall long term operational and maintenance costs. The project is currently in the planning phase with design phase to commence in July 2014. It is anticipated that construction will commence in the fall of 2014 with construction completion slated for mid-2015. The City of Jamestown Raw Water Intake experienced a catastrophic failure to a pump during January 2014. This resulted in damage to adjacent electrical and pump system components causing the entire raw water intake to be shut down for a period of time and a state of emergency declared by the City Board of Mayor and Alderman. Immediate efforts were put underway to temporarily bring the facility back on line with long-term disaster mitigation steps undertaken thereafter and still today. The project consists of the replacement and/or renovation to damaged electrical and pump system components within the facility. The existing damaged pump motors and a number of electrical system components have been replaced and/ or repaired. Additional electrical components will be replaced over the coming months with the overall mitigation slated to be completed toward the end of 2014. The City is continuing to work with its insurance carrier to facilitate a successful project conclusion. The City’s influent Wastewater Treatment Plant Influent Pump Station and Influent Equalization Basin (commonly referred to as the “Main City Station”) is slated for rehabilitation efforts to ensure state and federal compliance while looking to greatly increase the overall pump station efficiency. The proposed project consists of the rehabilitation of the existing pumping station and to provide for enhancements to the equalization basin structure and piping components. Preliminary Engineering has been completed and the project has been submitted to the State of Tennessee Economic and Community Development for funding consideration. The Central Avenue Sewer Interceptor is the oldest remaining interceptor within the City system and consists of 12-inch and 8-inch Vitrified Clay (VC) pipe that collects a large majority of the City’s sewer system. The proposed project will replace the gravity sewer lines with new Polyvinyl Chloride (PVC), High Density Polyethylene (HDPE) and Ductile Iron Pipe (DIP) sewer lines and includes replacement of all manholes with new watertight pre-cast manholes. This project will also rehabilitate a short section of existing 8-inch sewer near the Jamestown Regional Medical Center. The project was submitted for consideration under the State of Tennessee Community Development Block Grant Program in January 2014. It is anticipated that grant awards will be made in the fall of 2014. The City of Jamestown is currently in its fourth year of work on a comprehensive sewer system rehabilitation program. This program is necessary in order to replace ageing infrastructure based on a prioritized and strategic approach, which allows the City to plan for and allocate funds to the areas of the sewer system that need the most attention. During the early phases of the program in 2010, it became apparent that the Wallace Community sewer system was the highest priority. Funds were sought and acquired through the Community Development Block Grant Program and the project completed during 2011. Continuing forward with the program, following completion of the Wallace Community Sewer System Improvements, the North Jamestown Sewer Interceptor was the next priority. Funds were again sought and acquired through the Community Development Block Grant Program with the project completed during 2013. The program is continuing forward and our latest efforts indicate that the Central Avenue Sewer Interceptor is the current priority for capital funding for the City. The City has requested funding from the Community Development Block Grant Program for this phase of the work as the overall Sanitary Sewer System Evaluation Program. The City continues with the rehabilitation program and anticipates doing so for many years to come. The City has acquired state-of-the-art flow monitoring technology which allows us to better understand and prioritize our sewer system needs. By staying ahead of the needs and not simply applying “band aids” to the problem areas, we are able to properly plan for and fund program priorities. The State of Tennessee and the Jamestown community have been devastated by natural disasters during 2008 and 2010. In order the help communities across the state, the U.S. Department of Housing and Urban Development (HUD) set aside funds tto assist eligible communities in recovering. The City of Jamestown was designated as a disaster community by HUD guidelines for the tornadoes and straight line winds that struck the City in 2008.Jamestown was awarded $565,000 from the State of Tennessee through the Community Development Block Grant Disaster funds. The City used this funding to purchase new radios, the fire truck as well as other fire equipment, and a generator that will be installed at the Community Center summer of 2015. The Wastewater Treatment Plant Improvements Project consists of a comprehensive rehabilitation to the City’s million-gallon-per-day wastewater treatment plant. The project includes the replacement of all major process components at the facility along with the addition of state-of-the-art controls and computer system technology. The project is expected to provide for much more efficient operation while ensuring long-term compliance with state and federal discharge requirements. The project consisted of two major equipment procurement contracts (Contracts A and B) along with one prime general construction contract (Contract C). All contracts have been completed. Airport Committee meeting Third Tuesday of each month at 6 p.m.
City Council meeting Second Monday of the month at 6 p.m.
UCHRA Public Transit System Door-to-Door Services - The Public Transit System provides affordable, safe, dependable public transportation for all 14 counties in the Upper Cumberland region by offering door-to-door, zone, and non-emergency transportation service. Vans are available with equipment to serve persons with disabilities. Everyone can ride! Hours of operation are Monday through Friday from 6 a.m. - 6 p.m. Reservations for a trip are made on a first-come, first-served basis. Call the local UCHRA office at least 48 hours in advance to schedule a trip. Requests made less than 48 hours in advance will be considered based on available space. Local trips are $1.00 each way and $1.00 for each additional stop. Fares outside of designated local area are based on miles traveled and will be charged accordingly. Scheduling is available Monday through Friday from 8 a.m. - 4:30 p.m.
For more information about the Public Transit System’s door-to-door or zone services, including the days and times of each zone, please call the local UCHRA county office. City government is here to serve you, and as a member of our community, we would like for you to be able to voice your concerns or complaints. This form will be used to identify issues and address them promptly, fairly and efficiently. Should a problem require urgent attention, please call us immediately at 931-879-8815 or the police department at 911. *Please note anonymous complaints will be treated with the same importance as any other complaint; however, anonymous complaints cannot always be substantiated. All contact information is completely confidential. Thank you for your assistance. If you would like a response, please remember to include your email address in the box below. All contact information is confidential.